Families training their brains together see more health and wellness benefits than those where only children train. Discover how to help your child enhance school performance and emotional wellness. Neurofeedback optimizes mental and emotional fitness, and allows children to lead mentally healthy lives. There are many ways to support and benefit your children's wellbeing and school performance. The current trend called brain training is a smart addition to a healthy lifestyle, especially if there is stress and performance anxiety at school. There are many kinds of brain training, and here we'll focus on the latest technology: neurofeedback. This technique optimizes mental and emotional fitness through monitoring and giving feedback about brain wave activity. In our eight years of helping families, it has been our consistent observation that in families where everyone engages in brain training, including the parents, have the best outcomes and are most satisfied. We will discuss why further on. Historically, brain training has been defined as any program that helps with cognitive skills. However, in the last 20 years, the increased speed and power of computers allowed for a new form of brain training that actually helps you track and train yourself based on brain wave activity, through EEG sensors. Your brain's electrical signals, known as brainwaves, are the brain's main way of communicating, along with neuro-chemicals, called neurotransmitters. Like electricity being sent through wires, the brain uses different brainwave frequencies during different functions. For example, when we are sleeping Theta waves are dominant. When we're focusing on schoolwork, Alpha waves are dominant. Our brain waves communicate important information about how well the brain is functioning. Subsequently, collecting and giving feedback about them is a powerful form of training, especially when trying to optimize mental or emotional performance. Just to give you some idea of the brain's computing power, researchers in Japan and Germany found that it took 40 minutes using the combined muscle of 82,944 processors and the fourth fastest supercomputer in the world to mimic just one second of your brain's processing ability. When personal computers became powerful enough to match the speed of brain functions, neurofeedback came into existence. Fast forward to today, parents are looking for supports to give their children a competitive edge or to help them perform at their mental and emotional best. When they do their research, many parents like the idea of neurofeedback because it's helping optimize overall mental and emotional performance. Other programs, such as brain training apps, focus on just one: either cognitive or emotional. When parents want to help their children’s overall performance, neurofeedback with the NeurOptimal® system is becoming a leading choice. The NeurOptimal® system enhances mental and emotional fitness at any age and is 100% safe and non-invasive. Here at Neurofeedback Training Co. we offer years of expertise in the field and a number of training options to meet your needs. Brain training games, such as those found on brain training apps, provide limited benefits. First of all, they only focus on either emotional or cognitive indicators, meaning they do not enhance overall brain function. Because the brain has two functions, mental and emotional, it is vital to train both for optimal performance. Brain training games only focus on half of the problem, which means they do not provide the same benefits as more holistic approaches. Secondly, the benefits they provide are not necessarily translatable to everyday life. Studies have shown that brain training apps mostly train you to be good at the game, and these skills cannot be used in other areas. For example, solving an online puzzle will only improve puzzle-solving skills, and will not improve cognitive functioning in other areas, such as at school or at work. Unlike games, neurofeedback trains both cognitive and emotional skills. This holistic approach translates into increased overall brain performance and benefits that can be used in any situation, whether it is at work, at school or in the household. The NeurOptimal® system does not use games, but rather neurofeedback training. This means the whole brain is being trained and allows for the development of core life skills, such as focus and emotional regulation. While games are limited in their potential to affect important areas of life, neurofeedback enhances the basic skills needed to succeed. Who Benefits from Brain Training? Everyone can benefit from brain training. Mental fitness is a key measurement of brain health. A healthy brain completes tasks more easily, due to increased focus and clear thinking. These skills can be applied to any area of life, from buying groceries to acing a math test. The right brain training program can improve mental fitness through repeated exercises. Neurofeedback training is a form of exercise for the brain. Just like we need to keep our bodies active for them to stay healthy, we need to exercise our brain to improve our cognitive fitness. In the same way, if your brains doesn’t get enough exercise, it becomes weaker and less efficient. Just like bodies, human brains need regular exercise to stay healthy and function at their best. Neurofeedback is a safe way to exercise the brain for anyone at any age. Because it focuses on developing core skills rather than specific abilities, it can benefit anyone, regardless of age, gender or profession. Staying focused, calm and logical are skills everyone needs to succeed. This is true for children who encounter frequent tests at school, and adults who need to problem-solve at work and in the home. An added benefit is that people with healthy brains are also calmer and work better in teams. This means that not only does the individual benefit from increased efficiency and focus, but everyone around them also benefits from their calmer mood. Because life can be overwhelming, it is vital to keep your brain in optimal shape. Brain training is a great way to keep your brain happy and healthy, so that it can face any challenge that comes your way. As mentioned above, when parents engage in brain training, children have better experiences and everyone sees the benefits faster. There are a few reasons neurofeedback benefits for children are enhanced by their parents’ training, particularly with the NeurOptimal system, which is focused on overall optimal performance. Firstly, when parents engage in neurofeedback, they experience increased calm, feeling grounded, support for emotional resiliency and focus. This makes them better able to communicate with their children, manage the household schedule, and regulate their own and their children's emotions. Here is what one recent mother said after having rented a NeurOptimal system. She trained regularly as well as her children. "I originally sought neurofeedback training for my daughter who is eight for focus and attention, as well as receptive and expressive language delays, and sensory issues. I scheduled a few training sessions for myself first in order to see what the experience is like. Alison [a neurofeedback coach] explained that a rental is a more cost-effective approach that also would allow the whole family to train. I've always seen my daughter’s issues as linked to my own stress and worry as a parent so it felt great to have my intuition affirmed in "neuro-language." "I Immediately felt that the reduction in my stress levels was as a result of training had positive ripple effects on my family." "My daughter experienced reduced sensory symptoms around sensitive areas (we can change her earrings now without a 20 minute panic attack – and she did her first forward roll in gymnastics the other day as well as jumped in the swimming pool for the first time – she was always too nervous before! The two months we rented also coincided with increased clarity and confidence in reading in school as well as marked verbal expression around focus and 'difficulties with focus.' My now 5-year-old son used the most sessions ~ requesting them often 'because it feels good' and demonstrated increased receptivity to redirection & increased awareness on his part around his behavior as it connects to his emotions". Why Brain Training With NeurOptimal Neurofeedback? Neurofeedback with the NeurOptimal system is a noninvasive and holistic brain training that teaches self-regulation and helps build resilience and flexibility in your brain. NeurOptimal® works by training the brain to use present moment information to decide what to do next, rather than old, often out-of-date information. This advanced brain training technology--developed in part by NASA-level engineers -- works by triggering what is called the orienting response, which is the brain’s ability to sense change in the environment and take in new information about what is different. People train using NeurOptimal for a variety of reasons including managing stress levels, mental fitness, focus concerns, peak performance and performance anxiety, spiritual and personal growth. NeurOptimal supports your brain to be in the ‘present moment’ which means your brain can truly live in the ‘Now’. This means your brain is able to access the resources it needs now, and not cycle in the past or get overwhelmed by future thoughts. Just like going to the gym, the more you train the stronger your brain becomes! 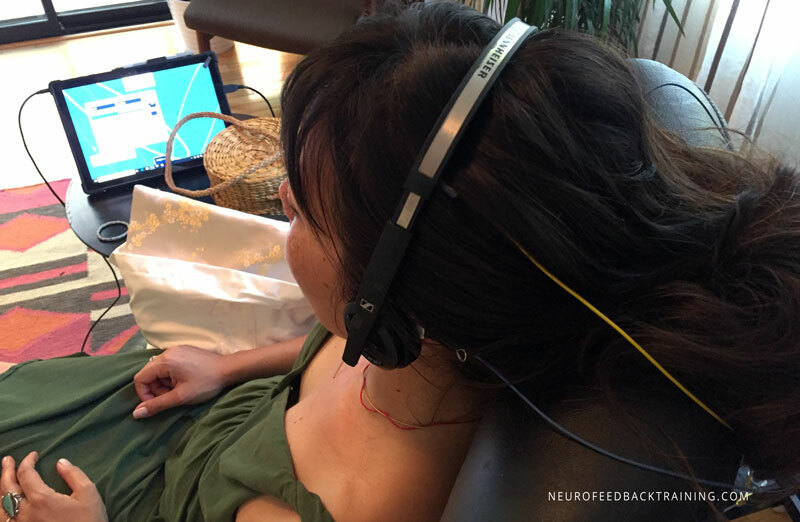 What can I expect in NeurOptimal Neurofeedback Session? 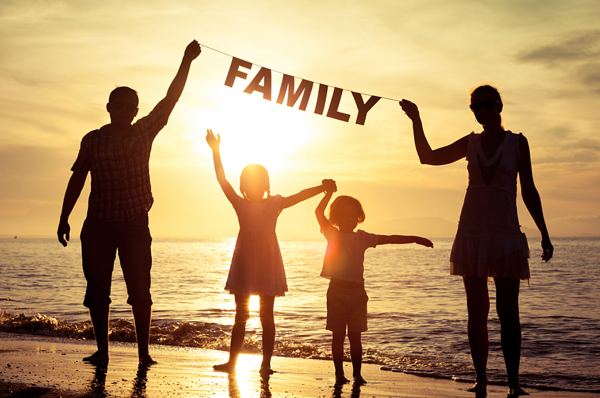 Before starting, fill out a checklist for all family members. It's the best way to track improvements, alongside noticing the behavior and mood changes firsthand. Five sensors are placed on scalp and ears. The sensors role are to read your brain's activity and give that information back to the NeurOptimal software. It's important to know that nothing is added to your brain, therefore it is also safe and has no side-effects. You listen to music streaming from headphones. The audio is the primary source of feedback. Randomly there are hear "skips" or "scratches" in the audio – this is the feedback that allows your brain to be brought back to the present moment. You sit and relax in a comfortable chair or couch (floor is also ok). No conscious effort is required, in fact, one can talk, "zone out", daydream or even sleep - the brain will do all the work for you! Simply relax for 33.5 minutes and enjoy the experience! Watch our video of what happens in a session. 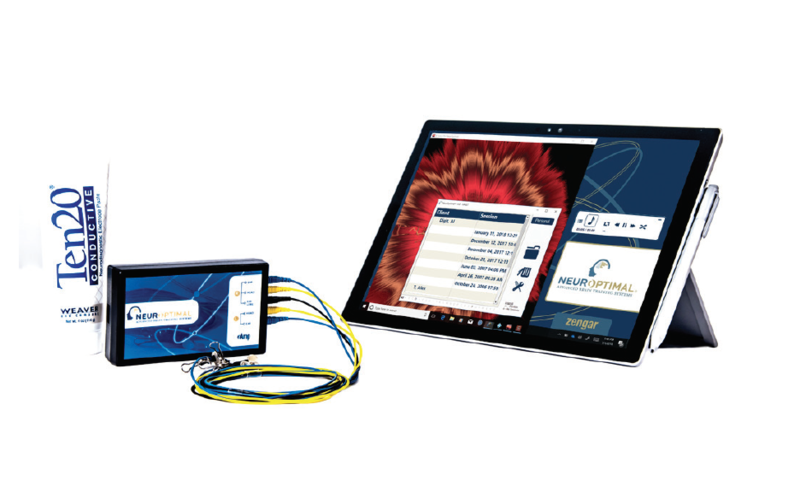 The advanced NeurOptimal system is a fully automated neurofeedback system. While in session, no conscious effort is needed - the brain and system are doing all the work! Simply enjoy and relax for the 33 minutes of the session. You can read, sleep, talk and even play a game. 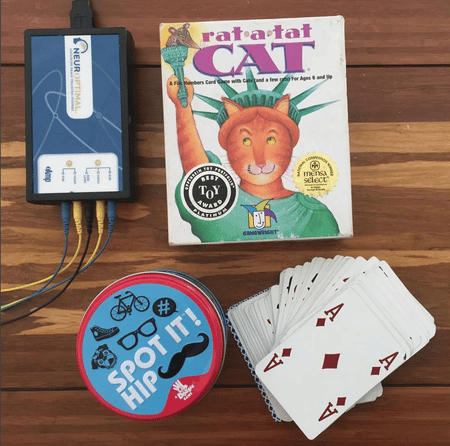 If renting a home system, sit with your child and play a game of rat-a-tat-CAT or Spot It! Work on your memory and focus together. Let’s see who will win! Yes. 100%! 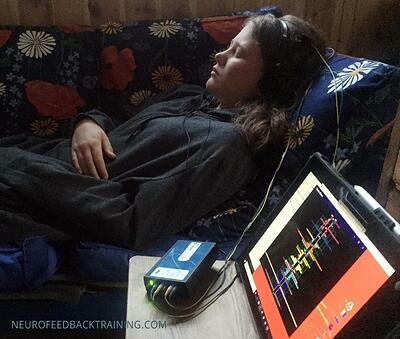 Neurofeedback Training with NeurOptimal® is completely non-invasive. As mentioned earlier, nothing is added to the brain. A NeurOptimal session is an enjoyable experience. You child may be wary of having sensors attached to their scalp at first, and may have trouble sitting still. If so, introduce neurofeedback training as something that is fun and beneficial. If one or both parents are also training it can be helpful to train first and let your child watch or sit in the same room while you have your first session. Kids, especially young children, want to do what their parents enjoy doing. It is important to give your child some choice about training; give them the opportunity to decide where to sit in the house (or office) or what they would like to do while in session (playing board games or with puzzle, talk, draw or read). Remember you can even sleep during a session – training will be just as effective! The complexity is in the software which means that there is no need to control thoughts and emotions - just let the training happen while listening to pleasant music. Your brain will learn to let go and be in the present. This leads to greater calmness, focus, awareness and confidence. The dynamical Neurofeedback® provides each brain with the information it needs to correct itself and function at its most optimal. Given that every brain is different there is no one-size-fits-all, and the results from neurofeedback training varies from person to person. That said, we have noticed consistently over the years that children shift more quickly than adults do. There could be a couple of reasons for this faster change. Unlike adults, children have billions of unassigned neurons, the brain's roadways. And young brains are much faster to respond to new stimulus and require significantly less energy to respond to changes. Children also don't have such powerful minds and a fixed sense of self-identity that can interfere with change that wants to happen. For example, one change that often happens with brain training is that clients feel calmer and more focused. As adults, if we have a conceptual identity as "a worrier" we can, through our thoughts, re-arouse a state of worry. Children, on the other hand, tend to stay calm once they have calmed down. They are more comfortable with their minds following their bodies rather than their bodies following their minds. "I used it almost every day because the effect was so helpful for me immediately. Into the second month I could really see a change that remained between sessions, and my brain seemed to respond more readily to the training. I cannot buy at this time, but will probably rent again after a few months. I believe that this system is far more powerful , and has potential for more actual support in my healing than may be wise for Neuroptimal to put in writing😊 – Thank you for making this available. I look forward to when I am able to rent again." NeurOptimal® has been determined by the FDA to be a General Wellness Product. NeurOptimal® is a training and not a treatment. 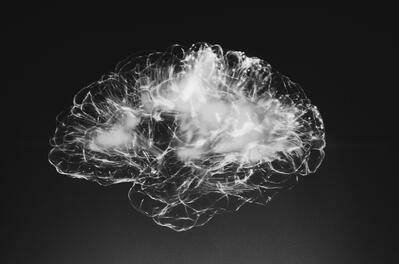 Consequently, NeurOptimal®does not require diagnosis or treatment planning. You should be under the care of a physician for any medical disorder. Learn more about NeurOptimal here.